High-quality, hand-made, hard-leather airgun pellet pouches in a range of colours & sizes. Ideal for all airgunners, field target shooters and hunters. The Wilkins Airgun Pellet Pouch is a beautifully hand-crafted, hard-leather pouch that can be clipped to the belt or worn around the neck, allowing easy press-stud access to pellets while shooting. Thank you, it arrived the other day. It is an absolute beautiful bit of leatherwork and craftmanship, I love it. I am going to be ordering a medium alongside my large one. The pouch arrived today in perfect condition. Truly a beautiful item. Thank you very much for the great customer service, and quick delivery. Still love that pellet pouch, best bit of kit I have, joy to use. It has come! Very very nice pouch, I am very satisfied! Thank you! Yes, they arrived really quickly – thanks! The pouches are wonderful, will be ordering some more in the coming weeks, so many more uses! My father has nabbed the large one off me already. Maaan is this pouch the sweeeeetest pellet holder i’ve ever seen or had. This holder is not only a thing of beauty but sooo handy and right for using in the field. I got it took one look at it put on my neck and just started wearing in the house going from room to room looking in the mirror at it. Best pellet pouch any shooter could ever want or get. My hat’s off to you Mike. This thing is off the chain. Thanks man. I received my pellet pouch early this morning and just wanted to say what a nicely crafted piece of equipment this is! In fact even if I was not into air rifle shooting I would want one of these purely because its such a very nice object. I look forward to many years use from it. Thank you for your prompt service. 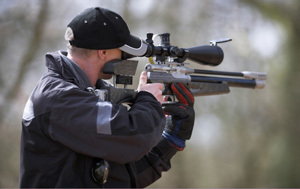 Overall an excellent way of carrying airgun, or even Rimfire ammo. If you use an airgun then get one of these... Well made, solid and above all practical. They're one of the best products we've yet come across for carrying and protecting pellets out in the field, for hunter or target shooter.